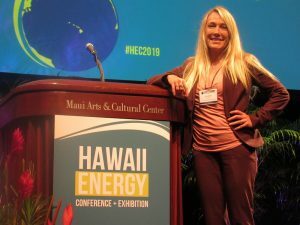 Originally published in The Lahaina News – April 11, 2019 – On March 27-28, West Side resident Jennifer Potter attended the sixth annual Hawaii Energy Conference (HEC) and Exhibition at the Maui Arts & Cultural Center in her role as commissioner on the Hawaii Public Utilities Commission (PUC). Potter holds a Master’s Degree of Science in Public Policy and Management from Carnegie Mellon University and a Bachelor’s Degree in International Studies and Economics from Southern Oregon University. 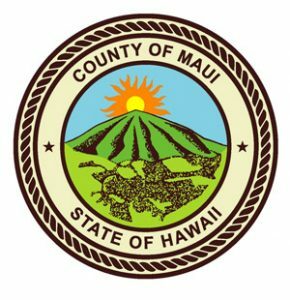 Committed to Hawaii’s ambitious renewable energy goals, Commissioner Potter also brings her wealth of experience as a senior scientific engineering associate at Lawrence Berkeley National Laboratory to the PUC. 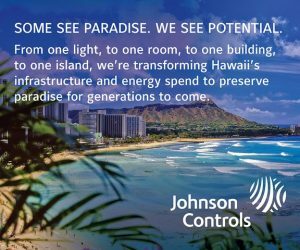 “Hawaii continues to be a leader in DER integration and is positioned to be a leader in utility-scale renewable projects in the next five years,” Potter said. Commissioner Potter became “hooked on energy” when she started working for a small electric utility in Northern California directly after graduate school. Becoming intrigued with how customer demand drives utility generation and supply, Commissioner Potter’s direction became crystal clear: customers are the main actor in the clean energy future, and when they use energy is critical. “If customers use less energy in the evening hours when energy is generated from dirty fossil fuel plants, and instead use most of their energy during the day when solar is abundant and powering our grid, then we have changed the fuel mix of our energy. We would be using more renewable resources,” Potter said. 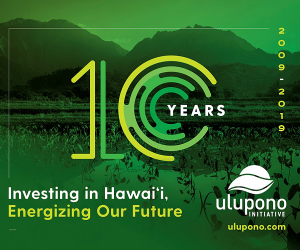 “We all have to work together to get to a 100 percent clean energy future, both the utilities and the customers,” Potter said, noting the announcement of the landmark Memorandum of Understanding (MOU) between Hawaii and California. The term “PBR” is synonymous with incentive regulation. Legislation was passed in 2018 that directed the PUC to implement PBR by 2020 that breaks the link between utility revenues and capital investments. “The commission has been working closely with stakeholders, consumer advocates and the utilities to define a set of goals, outcomes and metrics that will replace the cost-of-service and rate-based regulatory model of cost recovery for the utilities,” Potter said.